While parenting is respected in every sense of the word, we understand that it is quite a hard job. It’s even harder when it’s coupled with the responsibility of a demanding job. As a result, often than not, the wellness of others becomes a priority over your own. With children of her own, fitness guru and performance coach Jennifer Cohen understands the balancing act every parenting goes through. Luckily, this boss mom has managed to make it all work. She shares wellness advice on how parents can balance personal wellness with work and their kids. A parent’s day usually consists of meeting deadlines whilst also trying to cater to the needs of their kids. Nonetheless, it’s time to add yourself to that list of goals, no matter how little it is. Cohen advises that you take advantage of the little time you do get to – be it 20 minutes – to set mini goals for your workouts. You don’t have to wake up at the crack of dawn to work up a good sweat. There’s plenty of opportunities throughout a busy day for you to get a great workout in- all you have to do is take advantage of it. Before heading into the shower after your alarm goes off (or your kids wake you up), stretch and do 20 push ups. Whilst making breakfast for the family, Cohen suggests using the kitchen as your mini-workout studio. You can use the counter for support and do some calf-raises, which helps to strengthen your leg muscles or lunges. They improve balance and also help to rest the spine, which is particularly important for those who have desk jobs. 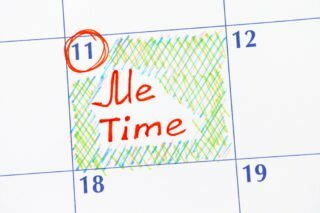 While you’re unlikely to be able to sneak off to the Caribbean for a quick vacation, Cohen has a suggestion or two to which you can incorporate me-time wellness into a packed schedule. Even if it requires you adding some time for yourself on the refrigerator calendar or sneaking away for 5 minutes right after you drop off the kids at school, Cohen advises that you use this free time to do some squats, meditate, or even take a quick jog. If you really unable to fit that into your schedule, simply stand up from your desk and use 5 minutes out of every hour to go for a walk around the block. While your children and job are a priority, you should be too as at the end of the day. If you don’t prioritize your wellness, how do you expect anything else to fall into place? Another busy Jennifer that is doing great at the balancing act is Jennifer Garner. Click here to find out hoe she keeps her household running and her arms toned.